Doctor Who Dalek Head Flashlight Book Light: Feel like a Dalek every time you open a book to read! Minus the whole feeling-nothing-but-hate-and-driven-to-exterminate-all-life-in-the-universe thing that the Dalek's have going on, of course. This Doctor Who Dalek Head Flashlight Book Light is the perfect thing for cracking open a book and diving right in to its fantastic fictional (or non-fictional!) world when there's not a lot of light to be had. Are you a night-reader? Then this is the perfect thing for you! Humans don't have their own natural way of illuminating things, so take a page out of the Dalek's handbook and modify yourself! This great headband features an adjustable head strap to allow for an easy and comfortable fit. 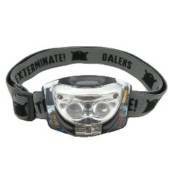 With this head flashlight on full-beam, "you would make a good Dalek!" Requires 3 x "AAA" batteries, not included. Ages 14 and up.